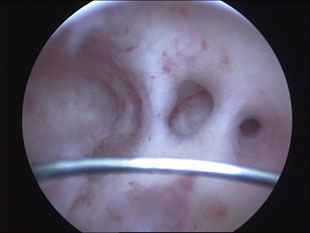 Asherman's syndrome is scarring inside the uterus that creates intrauterine adhesions -- fibrous bands that form between the walls of the uterine cavity. This scarring is believed to result from aggressive scraping of the uterus in the presence of infection or when an infection occurs after a D&C. It can also occur after surgery inside the uterus, such as the removal of fibroid tumors or polyps. The adhesions form as raw or infected surfaces heal. As the adhesions fill the uterus, sometimes blocking the cervical opening, menstrual flow can diminish or stop altogether. Thus, Asherman's syndrome is suspected if you have a D&C or other uterine surgery and then your periods are very light or they stop. The condition can be very mild, or it can be severe and irreversibly damage the uterine cavity. The condition can be diagnosed by an X-ray of the uterus called a hysterosalpingogram (HSG), as long as this X-ray is performed by a method that uses a small tube placed just inside the cervix. Unfortunately, HSGs are now usually performed by placing a small balloon catheter into the uterus. This technique is quick and easy to do and is excellent for evaluating the fallopian tubes, but it can miss Asherman's syndrome. At EmBIO, we have come to prefer a procedure called saline hysterosonography, which uses ultrasound. We check to make sure you are not pregnant and then place a tiny catheter into your cervix. Saline fluid (salt water) is injected into the uterus and the ultrasound is repeated. This technique can show the intrauterine adhesions quite well. 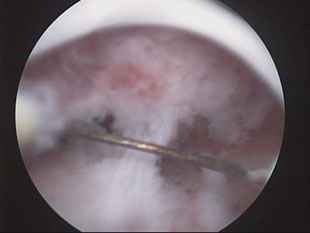 The gold standard for diagnosis, however, is hysteroscopy, which involves placing a small viewing device into the uterus to see the inside. It is amazing that each year we have better and smaller instruments to treat intrauterine problems. With modern instruments, many of these procedures can be performed in the office with minimal discomfort, using only a pain pill before beginning. For those women with minimal scarring, surgery to remove the adhesions can often be completed in the same setting. For more severe cases in which the margins of the hollow uterine cavity cannot easily be determined, ultrasound or laparoscopy (in which the viewing device is inserted through a small cut in the abdomen) may be used to accurately locate the limits of the uterine cavity. Success rates are above 85 percent when adhesions are minimal. However, if scar tissue has replaced most of the uterine cavity, there is little hope of restoring normal uterine function.